The cryptocurrency had a good day, the precious metal had a bad day and we had a historic day. Today marked a weird but auspicious moment in human history. 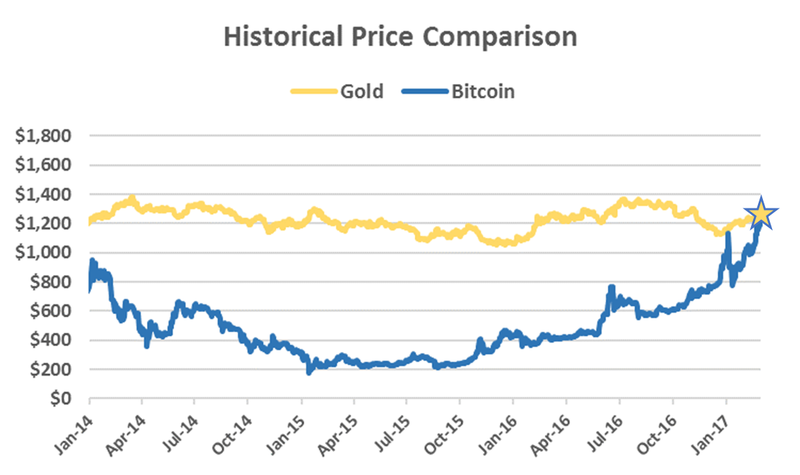 The value of a single bitcoin, the most mainstream of cryptocurrencies, surpassed the price of one ounce of gold. While that's specifically due to a good trading day for the former and slightly bad one for the latter, resulting in a moment where a loosely-comparable unit of bitcoin value topped that of gold, both have been trending toward this point for awhile. That's because, as both CoinDesk's Bitcoin Price Index (BPI) and Coinbase have tracked, the cryptocurrency has been slowly recovering from a low point at $200 per unit in mid-2015 up until today, when it hit $1,238.11. This topped gold's value of $1,237.73 per ounce, according to Bloomberg Markets, which has hovered around that price point for a couple years. Those values have varied throughout the day, although bitcoin's supremacy remains as of the time of publishing. People aren't necessarily ditching their gold to buy bitcoin -- their prices don't trade in correlation -- but they're both alternative assets, points out TechCrunch. Gold has traditionally been used as a more secure bet than volatile investments like real estate, so bitcoin's rise in value is encouraging for cryptocurrency advocates who have been hoping it could supplant the "gold standard" of safer investing.